Malaria remains a deadly killer in broad swaths of South America, Africa and Asia. Sometimes there's hope for wellness: as with recent reports of success deploying pesticide treated bed nets in equatorial Africa - the nets keep kids from getting bit by mosquitoes while they sleep. And, sometimes there are moments of despair, as when a follow-up visit to villages where free bed nets had been deployed found that many families had given up the nets, perhaps bored with getting the kids to comply. There is also absurd news, as with Think Tank "experts" asserting that environmentalists are responsible for the deaths of millions by causing the banning of DDT. (Never mind that DDT was never banned where malaria is epidemic, and that spraying the countryside every year would be completely infeasible.) The above headline from research in Brazil is unusual, because it links increased malaria to government policy making and corporate actions. In Brazil, where people are increasingly bit by the Anopheles darlingi mosquito, the national government, loggers, and settlers share responsibility for worsening malaria: SciDevNet reports that "A small reduction in tropical rainforest cover can increase malaria incidence by nearly 50 per cent, a study in the Brazilian Amazon has found." Add to that: "...human populations tend to move into areas that are recently deforested. If these are migrants that bring malaria with them, they can set off epidemics." The authors, from the University of Wisconsin, Madison in the United States, and Santo Antonio Energia in Brazil, an energy consortium, studied high-resolution satellite data of land cover from 54 Brazilian health districts bordering Peru from 1996 to 2006. They also examined health data collected in the same areas in 2006. They found that a four per cent change in forest cover was associated with a 48 per cent increase in malaria incidence. 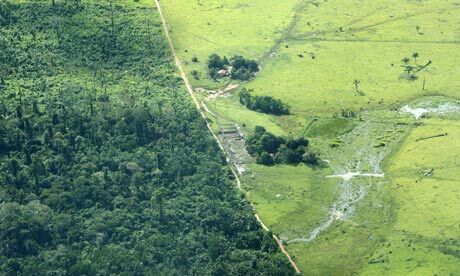 Areas with less deforestation had a lower malaria risk, suggesting a link between conservation practices and health. "We believe that the small change in deforestation is greatly amplifying the number of mosquito vectors, and thereby increasing malaria risk in humans," said Sarah Olson, lead author of the study. Cutting the trees results in stagnant pools of warm water that support strong mosquito populations - right where the settlers are arriving and living. Update: I've long wondered how it was that during settlement by Europeans, the American South had extensive malaria outbreaks. For awhile I bought into the simplistic 'they drained the wetlands' explanation of why malaria went away. (They still have plenty of wetlands of course) 'The DDT made it go away does not work either. Endemic malaria in the USA faded long before WWII to the 1970's, the period when DDT was widely deployed. Writing this post gave me an insight which at long last answers part of my question. European colonists cleared the forests, opening up habitat for the relatively rare malaria carrying mosquitoes, while moving into their buzzing new habitat. Malaria rates went up until many decades later drainage tiles were installed, water channelized, and farmers started driving tractors and installed screens on their homes. There is a while subtopic of this which deserves exploration but which I feel unqualified to comment on in depth: that slaves bore the brunt of the early exposure to malaria; and that African people carry a recessive gene for sickle cell anemia which coincidentally provides partial immunity to malaria.